The “Asian” Water Vapour Permeability Tester made of twelve mettalic bottles. 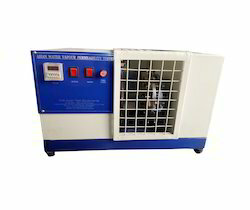 It measures water vapour permeability of leather. The bottles have nut of circular opening. The bottles are mounted on the bottles holders which rotate at specified revolution per minute with the help of motor pulley & belts. The axis of the bottles is parallel to the axle of the bottles holders. A fan mounted in front of the mouths of the bottles and consisting of three blades in planes that is inclined at 120º to one another. The planes of the blades pass through the prolongation of the axle of the wheel. A pre set digital timer is mounted for setting total no. Of hours of instrument movement. All the components are chrome/ zinc plating & painting for corrosion resistance long life. One of the test for determination of colour fastness of dyed of printed leather is the Crock Meter For Leather. This test is used for the determination of colour fastness against rubbing, either under dry or wet condition .In this test a moving brass finger of specified shape and size rubs against the test specimens under a fixed load. The amount of colour lost by the test specimen and the amount of colour transferred to a piece of abradant Leather fixed over the base of the moving finger are graded with the help of standard grey scales to evaluate the colour fastness of the sample under test rubbing. The “Asian” Bench Thickness Gauge for Leather is used for the thickness measurement of the fabric, paper, rubber, plastic, flooring, etc. Analogue and digital models are available. The systems consists of a dial micrometer fitted on a digital micrometer fitted on a rigid metallic frame. 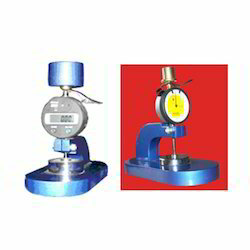 The micrometer has a flat circular indenter, which exerts the specified pressure on the fabric sample whose thickness is being measured through a dead weight. The fabric sample is kept on an anvil, which is in from of a flat circular platform. The axis of the indenter and the anvil coincide and is the same as the axis of movement of the indenter. 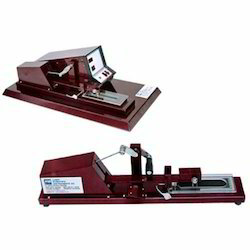 The indenter can be raised and lowered gently onto the fabric sample with the help of a lifting lever.